Ritson Road North will be closed for construction from the second week of June until the end of November if things go according to plan. 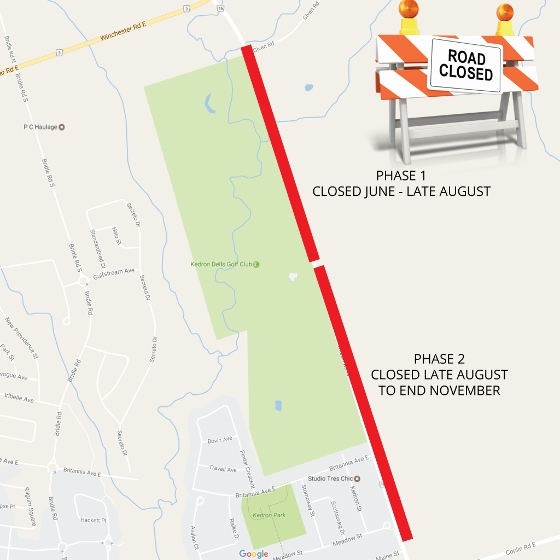 The first stage of construction will see Ritson Road North closed from Kedron Dells Golf Club to north of Given Road for 11 weeks - or late August. This will allow for access to the golf course from the south for this phase of the project. After completion of the first phase, the area closed during the first phase will open to traffic, and Ritson will be closed between Kedron Dells Golf Club and north of Maine Street. During this phase, access to Kedron Dells will be via the north. This is a major project, including the installation of new sanitary sewers, storm sewers and water mains, as well as improvements to lighting and stabilization of the slope where the temporary traffic light was installed last year north of the golf club entrance. Combined with the closure of Simcoe Street north of Rossland for another construction project, this closure will have substantial impact on North Oshawa traffic, especially during rush periods.